Join us to celebrate Cleveland Beer Week on two wheels at the “All Hail the Ale!” Night Ride on the Towpath Trail on Saturday, October 16, at 7:30 p.m. This FREE nighttime bicycle ride will begin at Century Cycles in Peninsula (1621 Main Street/Route 303) and will end with a tapping of two special cask ales at the Winking Lizard Tavern next door. • Decorate yourself or your bike in tribute to the event theme “All Hail the Ale!” While beer costumes are not required, they are highly encouraged. Those in costume will receive a drink discount at the ale-tapping and can win prizes, plus they won’t have their beer loyalty questioned. • Pedal your bicycle with a crowd of fellow bike-and-beer lovers on a 13-mile bicycle ride on the Towpath Trail. It will be guided by staff from event organizer Century Cycles – if you can guess which costumed characters they are. • At the ride’s halfway point, there will be Oktoberfest-themed snacks – pretzels, sausages, beer nuts and other salty delicacies – to fuel the ride back to the Winking Lizard Tavern and make you REALLY thirsty for some good beer. • Upon the Night Riders’ return and the safe storage of their trusty two-wheeled steeds, they are to head to the Winking Lizard Tavern in Peninsula for the tapping of two special cask-conditioned ales provided by Sierra Nevada Brewing Company and Left Hand Brewing Company. Those in costume will receive a discount. Not to be a buzzkill, but there will be no beer (except root beer) allowed or distributed on the Night Ride until the tapping. • Also on tap: Play “Spin the Water Bottle” to win some cool prizes from Century Cycles, the Winking Lizard Tavern, and the breweries. • Bring a few extra bucks, because the “All Hail the Ale!” Night Ride wants to further celebrate Cleveland Beer Week by supporting its charity, the Malone Scholarship Fund. Donations will be collected pre-ride and post-tapping. • Speaking of that worthy cause, Century Cycles is also donating an Electra Sparker bicycle to the silent auction at BREWzilla, the party that culminates Cleveland Beer Week to benefit the Malone Scholarship Fund. For a chance to bid on this bicycle and other great auction items donated by local breweries and companies (plus enjoy more amazing beer), attend BREWzilla on October 23. “We were looking for a fun way to end our most successful Night Ride season ever and beer is pretty darn fun. Having Cleveland Beer Week and the Winking Lizard along for the ride, so to speak, makes it even better,” said Scott Cowan, owner of Century Cycles. He declines to reveal what beer costume he plans to wear. While the Night Ride is FREE and requires no advanced registration, Night Riders must sign a waiver before participating and are responsible for the purchase of their own beer and food at the Winking Lizard. This ride is at night. Like, in the dark on an un-lit trail. That is why bicycle lights and helmets are REQUIRED. So is your own bicycle. (Yep, we have to say this, because every Night Ride we are asked “Do I have to bring my own bike?” Well, I’m not letting you ride mine, smart guy.) Children under 16 must be accompanied by an adult; young adults under 21 should ignore all the excitement about the beer tapping. Finally, make sure those awesome beer costumes don’t hang or catch in a bicycle’s spokes or chain (falling off your bike tends to ruin the fun) and that you can still wear your bike helmet in costume. Now in their 15th year, Century Cycles Night Rides were in the national spotlight last year when Bicycling Magazine, the world’s #1 bicycling publication, dubbed them one of America’s great local rides. Century Cycles Night Rides on the Towpath Trail are casual, ride-at-your-own pace bicycle rides (not races) about 12-15 miles long. All skill levels are welcome. They begin and end in the parking lot at Century Cycles’ Peninsula store (1621 Main Street, on Route 303 between Route 8 and I-271, next to the Winking Lizard Tavern). Parking is available at the Lock 29 Trailhead, just north of the store. 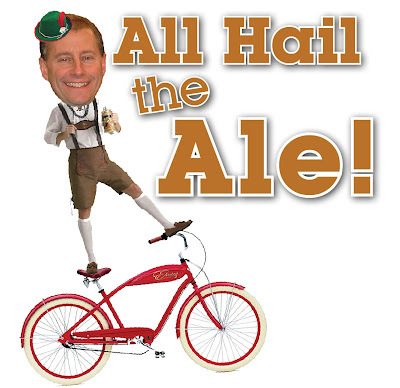 For more information about the "All Hail the Ale!" Night Ride on the Towpath Trail, go to www.centurycycles.com/for/CleBeerWeek. Now get to work on that beer costume!